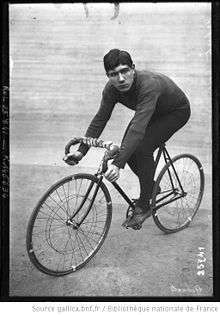 Gérard Debaets (17 April 1899 – 27 April 1959) was a Belgian racing cyclist. He won the Tour of Flanders in 1924 and the Belgian national road race title in 1925. He also specialized in track cycling, winning a total of 18 six-day events, including six times the most prestigious Six Days of New York. Debaets was a resident of Fair Lawn and North Haledon, New Jersey, where he died in 1959 of a heart attack. ↑ "Gérard Debaets". Pro Cycling Stats. Retrieved 29 April 2014. ↑ "Gérard Debaets". Cycling Archives. Retrieved 29 April 2014. ↑ Gabriele, Michael C. The Golden Age of Bicycle Racing in New Jersey, p. 93. The History Press, 2011. ISBN 9781596294271. "Following his retirement in 1945, he opened a bicycle shop in Paterson and resided in Fair Lawn and North Haledon." ↑ Staff. "Gerard Debaets Is Dead at 61; Won 18 Six-Day Bicycle Races", The New York Times, April 28, 1959. Accessed September 11, 2015. "North Haledon, N. J., April 27 - Gerard Debaets, a member of NORTH HALEDON, N. J., April 27--Gerard Debaets, a member of winning teams in eighteen six-day bicycle races and the holder of several national bicycle championships, died today of a heart attack at his home, 139 Oakwood Avenue."